67' Camaro stock retractable lap belts. It doesn't matter if you drive a classic muscle car or a modern van, they all have seat belts. 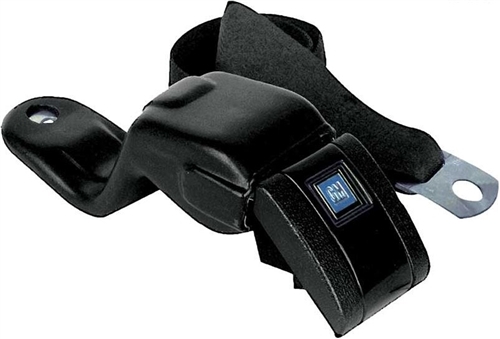 Turbo Camaro only has lap belts as shoulder belts weren't ordered. The original belts had been swapped with junk yard specials a couple decades ago. 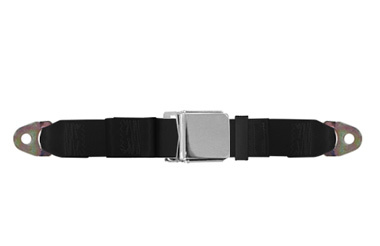 It was obvious "new" belts were needed but so many options exist it's tough to decide. A harness system could be a future proof idea, but a little excessive for daily driver use. Modern belts come with red tape as a lot of them are sold with matching shoulder straps and splitting the set can become a legality. Aftermarket muscle car inspired belts are sold in droves but will they hold up to the cool factor of original belts. It was decided a set of original, lap only retractable belts would be obtained for the front seats and stylish aftermarket for the bench. Aftermarket belt buckles are smaller, and in chrome look neater when tucked away in the back seat. A few people have asked why Turbo Camaro has two different style buckles and the simple answer is "because it looks great and Turbo Camaro likes to be unique." Three pairs of black seat belts with chrome "airplane" style buckles were installed in the back and a set of original year correct retractables for the front. 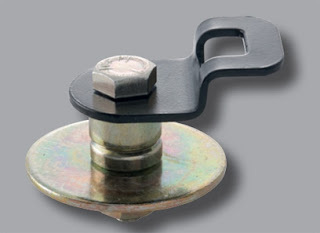 Universal child seat tethering anchor. look identical to the one in the picture, but the cheap 1" washer was swapped with 2" wide 1/4" thick fender washers. An additional fender washer was placed under the cardboard package tray, sandwiching the metal tray and ensuring the anchor is invincible. Little black rubber caps were put over the bolt head for style and to prevent a silver dot from reflecting off the inside of the back window. The anchors catch peoples eye all the time and it's surprising how infrequent this modification is done. It is noted the images on this page are generic. New images will be obtained and published here as soon as possible.